For me, a hammock doesn't quite fall into the category of travel, backpacking, or hiking necessities, but since owning such a light and compact one as the Sea to Summit Ultralight, I've found myself packing this hammock quite often. Even if you're a casual traveler, you should look into this hammock as an option for something portable and convenient. Setting up the Sea to Summit Ultralight Hammock is straight forward and easier than other systems in my opinion. 1. Release the mini compression straps around the hammock body and pull out all of the fabric. 2. If using tree protectors, sling them around the tree and threat the end through the loop. Otherwise sling the suspension straps around the tree and loop through. 3. Insert the aluminum strap buckle through the hammock body, making sure the tree arrow is pointed outwards towards the tree. 5. Adjust the tension and height by shortening or lengthening the straps on each side. Be sure to keep the blue strap holder close to the buckle at all times. One of my favorite features is the strap adjustment system. Other hammocks I've used require you to tie a knot on the suspension straps, and when you need to adjust the length, you end up having to retie a new knot each time. The suspension straps are quite long, and I haven't ever found a case where I wish they were longer. The tree protection straps could be a little longer, but they will work around most small to medium-sized trees, and the shorter length helps save some weight, which I appreciate. When packing up the hammock, a little more time is required to perfectly roll up the straps and tree protection straps. If they aren't rolled tight enough, sometimes they don't fit in their bags and need to be re-rolled. I do miss being able to stuff my suspension straps into a sack, but this way, they entire packed hammock takes up less room. The reason the hammock is so lightweight and compressible is due to a special nylon monofilament fabric. I find the fabric to be really breathable and moisture wicking, which could be cold for people who are looking to sleep in this hammock, especially in windy conditions. I'm not really the hammock-sleeper type of camper, so the breathability not an issue I'm concerned with. I also find it soft and comfortable against the skin. As sheer and delicate as it looks, the material is strong and sturdy, and is rated to hold up to 300 pounds. As with any hammock, I do make sure to hang the hammock in a place free from branches or sharp objects that could snag the fabric, as the material does seem slightly more delicate than other hammocks out there. Note - one drawback to this specific fabric is you can't use the hammock when wet. The hammock itself weights 5.4 ounces, the straps 2.7 ounces, and the tree protection straps 4.8 ounces. Since you don't need to use the tree protector straps, this means that the system would weigh from 8.1 to 12.9 ounces. In the hands and in my pack, this feels very light, and I'm still always amazed at how much fabric fits inside the sack - sometimes I feel like a magician pulling out all of the fabric. 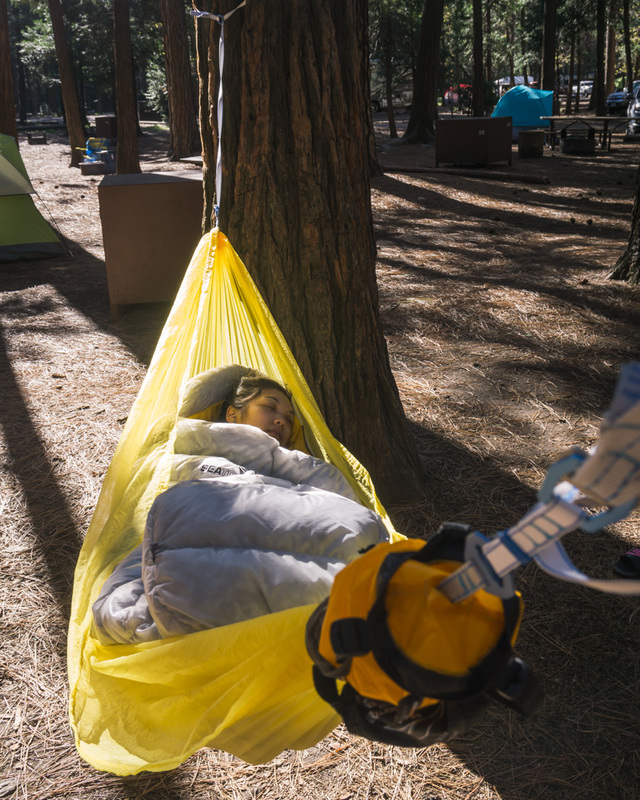 As for size, the packed ultralight suspension straps actually can fit in the hammock body compression sack, and together they are about the size of a soda can - which is so impressive! If you're looking for the lightest, most compact technical hammock around, or if you're a casual hiker and adventure traveler like me, the Sea to Summit ultralight hammock can't be beat. Even though I've listed lots of cons, none of them are that big of a deal to me. These cons are just small notes I thought could be improved, but they don't bring down my overall score of the product. Because of how small and light it is, I often find myself throwing this system into my luggage or hiking backpack, and I'm always so thankful for having one on hand when I encounter the perfect hammock spot. There's nothing more satisfying the kicking your feet up and laying back in a swaying hammock with an epic view, either while traveling or during a day hike. Click here to see all of my favorite gear! Disclaimer: Although the hammock was sent to me, this is not a sponsored post and I was not required to write anything. All words and opinions are my own. This post does contain some affiliate links. What this means is I might receive a portion of the sales, at no cost to you. If you choose use them, thank you for your continued support!